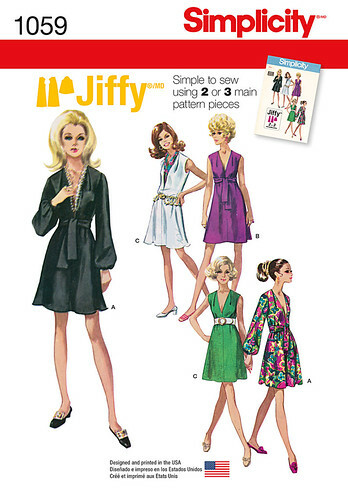 Allie Jackson: Announcing: Share your 70s Sewing! When fashion people started saying the 70s were back, I thought: no. No way. I do not like it, and I will not wear it. Not in a box, not with a fox. Of course, this always happens. In the past, I have disavowed side-parted hair and skinny jeans, so I'm obviously terrible at telling what I will or will not like in the future. That said, I'm not totally head over heels in love with 70s style. I am starting out very selectively, my interest currently limited to two new Retro Simplicity releases. But aren't they gorrrrgeous? I would totally wear either. Maybe even in a box, with a fox (...fur stole). OKAY FINE so technically 1059 is from 1969, you caught me. But don't you think it has a nice 70s feeeeeel to it? Although there isn't a date for 8013 on the pattern, I asked Simplicity on twitter and they said they think it's from 1977. For having almost a decade between them, there are a lot of similarities between the two patterns: v-necks, volume, and very nice bell sleeves. Honestly though I know basically nothing about 70s fashion--just that I have some knockout patterns that I'm excited to make! After my twins project with Sewing the 60s, I was super inspired to do some more of this "collaborating," and "community-building," so I thought it might be fun to open this up to all y'all! I asked Emily from Mai Attique (seriously click that link, she's sewing some really great, totally wearable, vintage-inspired clothing) if she wanted to co-host some super low-key sharing with a 70s theme. 1. 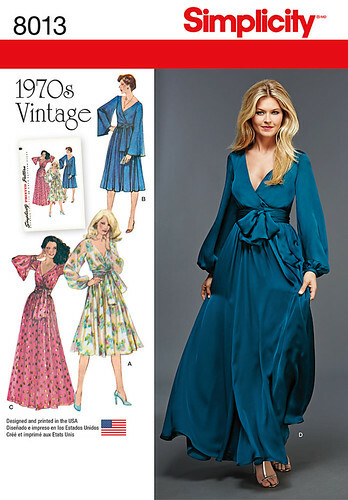 Between today (November 16th), and December 14th, sew anything 70s. It can be an original pattern, a repro or retro pattern, or just something 70s-inspired. Go as elaborate or as simple as you like. 2. Link it up here--you can link to a blog post if you have one, or a flickr album or (I think) an instagram picture. 3. December 14th, Emily and I will be sharing our 70s-inspired creations on our blogs. 4. Hopefully, we'll have a few participants, and I'll post some of my favorites here (with permission of course) and show you off! That's it! As you can see, this is not a sewalong or a contest--nobody has time for that during the holidays!--it's just a fun thing we thought people might enjoy. If you have any questions, or issues with the link-up, email me at hello at alliemjackson dot com or leave a comment below! ps: if you sew something from 1969... well, i can't really judge, can i? Well, I was literally just telling my boyfriend that I thought I should probably make a new shift dress from my favourite 70s pattern book, so I will try and play along. Signing up for things is usually the first nail in the coffin to getting them completed, but I'd really like a new party dress to wear over Christmas. Yay, join us! I had a quick sneaky peek at your blog and that 70s halter would be perfect as well (if a bit unseasonal)! I was a teenager during the 1970's so I think by definition I am not allowed to wear clothing from that decade ever again. I will sew something though! I just looked at the halter pattern on Laura's blog and yes I did sew my own halter tops during the 1970s. Everyone made halter tops! YES! I have been going through my vintage patterns, putting some on Etsy (because I have a crap ton of them) and looking for cool ones to sew. I'm so up for this! Finally I have remembered to join in. I have two things from the 1970s era... well, one is from 1969 :D. But very 1970s style already, I dare say. I'll link up to them here and include linkbacks in my posts. I wonder if anyone else joined? I can't see any links but maybe my browser is having a hiccup? I mean, surely there are more people sewing the 1970s! It's such a great era to pick something from. Wish I'd seen this...I love 70s styles! I hope you run this again some time.